Underwear For Men manufacturers and sells premium men's underwear for medical applications where good support and lift is required or to secure incontinence pads to prevent embarrassing leakage. Every style and generation of our men’s underwear feature the same US patented and Intl patents pending adjustable pouch design made to isolate, comfort and support. Underwear For Men is the only brand of men’s underwear that truly offers both isolation and support. Since 2013, Underwear For Men has sold its underwear to men throughout US, Canada and UK. Whether they are recommended by Doctors for post groin surgery, for moderate or severe incontinence problems, or for a sagging manhood, our briefs and boxer briefs have proven time and time again to offer superior support and comfort. If this is your first time trying Underwear For Men, we recommend starting with any of the 4th Generation styles. Intricately Engineered to Support Your Patient’s Manhood! If you recommend support underwear to your patients for medical conditions or following surgery, you know the challenges of actually getting them to follow your instructions. Patients don’t know where to buy support products. They don’t like how the support products look or feel. They don’t want to spend money on a product that may not work or that they might only use once. We got all of those excuses beat and more. Some doctors prescribe jockstraps after groin surgery, but they are bulky and uncomfortable. Some doctors direct patients to wear compression shorts for chafing and sagging, but they just smoosh everything into a hot, sweaty mess. The innovative adjustable pouch in our mens briefs and boxer briefs offers the isolation, comfort and support your manhood needs to recover, while also preventing sagging, rubbing, chafing and sweating. The drawstrings allows every man the ability to determine his level of support. The pouch is made of soft, breathable fabrics keeping your manhood nice and cool, and away from your thighs. This is Underwear For Men. 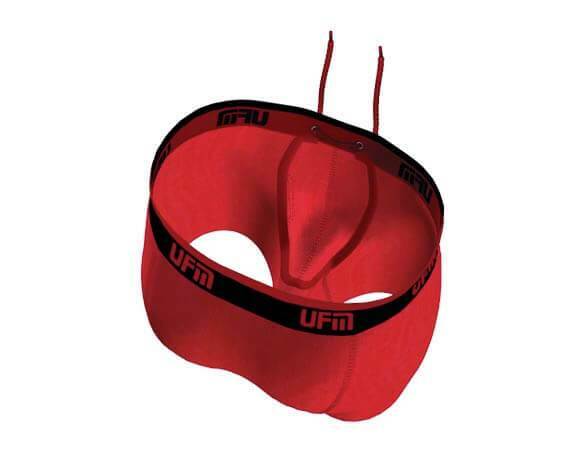 UFM Underwear is stylish and comfortable underwear that takes care of leaks by pairing with commonly used male incontinence guards. The biggest problem patients report with incontinence underwear is keeping the guards properly in place. Incontinence guards are designed with a liquid absorbing “target area”. If the guard moves out of location, the liquid misses the target and can lead to embarrassing accidents. Our US patented and Intl patents pending adjustable drawstring pouch locks the guard in place so your manhood stays dry and accident free. Underwear For Men’s US patented and Intl patents pending drawstring support system works fantastic in combination with the leading disposable male incontinence guard products such as Depends and Prevail. Our mens underwear helps you maintain your dignity and improves your quality of life. Our boxer briefs and briefs are the most stylish and comfortable men's underwear product on the market and the US patented and Intl patents pending drawstring system will lock the guard in place. As we grow older, parts of our bodies continue to grow. Our ears, noses and manhood are just a few of them. As your manhood gets larger and begins to sag, it gets uncomfortable. The older you get, the more important support becomes and men often revert back to tighty whities. Underwear For Men’s US patented and Intl patents pending adjustable pouch underwear is made to comfort, isolate and support your manhood. Because our pouch adjusts to fit your size, it works perfectly for men with medical conditions such as Hernia, Hydrocele and Epididymitis that require extra support. Does not use elastic to provide support. Does not lose support through the laundry cycle. NOTE: UFM DOES NOT MAKE ANY MEDICAL CLAIMS OR REPLACE ANY TREATMENTS OR THERAPIES RECOMMENDED BY YOUR DOCTOR. ALWAYS CONSULT A PHYSICIAN IF YOU ARE EXPERIENCING ANY TYPE OF MEDICAL PROBLEM.